12:30, ESPN. PBA Bowling. Go RVing Classic. 1:00, ESPN Classic. NBA. 1993 All-Star Game. 1:00, CBS. College Basketball. Georgia Tech @ Duke. 1:30, NBC. PGA Golf. Champions Tour Outback Steakhouse Pro-Am, Final Round. 2:00, ESPNU. College Basketball. Notre Dame @ Cincinnati. 2:00, FOX. NASCAR Racing. Nextel Cup, Daytona 500. 3:00, ESPN Classic. NBA. 1998 All-Star Game. 3:00, CBS. PGA Golf. Nissan Open, Final Round. 3:30, ESPN2. 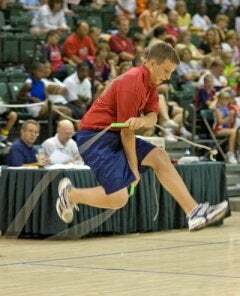 2006 Jump Rope Championships. 3:30, NBC. NHL Hockey. Regional Coverage. 4:00, ESPNU. College Hockey. Dartmouth @ Yale. 4:00, ABC. Figure Skating. State Farm U.S. Championships. 4:30, USA. Movie. Bring It On.